The Alexandria Canal section of the Sydney Green Ring under the Flight path at Mascot. The Sydney Green Ring is a 37 km active transport corridor, a circle, a ring road and an art trail that hugs existing water courses through many green spaces of Inner Sydney. It connects some of Sydney's largest green spaces and provides access to Sydney Harbour and Botany Bay. The topography is flat to undulating making for easy cycling with steeper climbs over the Rozelle ridge that could be addressed with the City West Cycle Link. 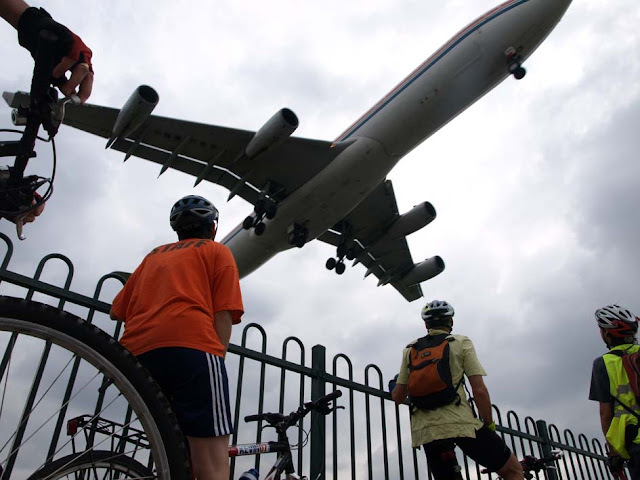 The route abounds with nature and open space connecting Centennial and Moore Park in the East with the Bay Precinct and Callan Park in the North, the Cooks River to Iron Cove GreenWay in the West, and Cooks River Cycle Path in the South. There is potential to include a path through the Botany Wetlands the largest freshwater wetlands in Sydney. There are a multitude of trip generators such as airports, transport hubs, schools, universities, the medical precinct in the east, aquatic centres, dining and entertainment precincts, sports and playing fields, the CBD, and Darling Harbour. It provides access to some of Australia's best public art. It fits in seemlessly with the Walking Coastal Sydney agenda. Combined with the Botany Bay Trail this scenic tourism route links the point of first contact between nations at Kurnell - Cunnal with Sydney - Warrane. Bikes Botany Bay is a sister organisation to ARTcycle Inc. and other Bicycle User Groups promoting the development of safe cycle paths throughout Sydney. Sydney Green Ring and development of Sydney Green Grid. Click to enlarge, map legend appears on left. Select layers by ticking the box. 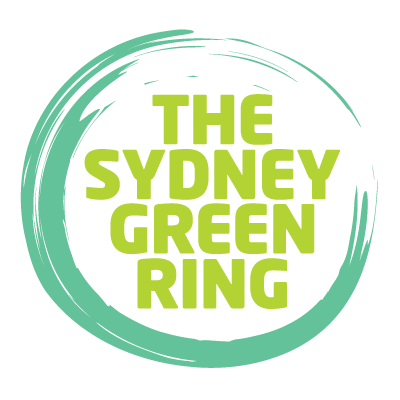 The Sydney Green Ring, is a grassroots, artist-lead project, and was developed independent of the similarly titled Sydney Green Grid, a NSW Government Architects Office project. Both were developed from the same or similar reference materials, with the Sydney Green Ring being an offshoot of the Cooks River to Iron Cove GreenWay inspired by Sustrans, the Metropolitan Greenspace Program and Sharing Sydney Harbour Program. The research for the Sydney Green Ring began in 2003 with a blog published in 2008. The Botany Bay Trail, part of the Great Kai Mia Way project, began over a decade ago in response to the The Tide is Turning: towards an environmental strategy for Botany Bay inquiry and report published as Turning the Tide, July 2001. The trail stretches around the foreshore from Cape Solander at Kurnell to Cape Banks at Laperouse. The Final Report of the Botany Bay Trail was adopted by the Southern Sydney Regional Organisation of Councils (SSROC) in 2009 (since closed and archived). City of Botany Bay bicycle plans including Sydney Green Ring. Click to enlarge, map legend appears on left. Select layers by ticking the box. As artists we explore subjective responses to place. We dont sit at desks, in an office and plan the routes our journey's will take using rulers, maps and calculators. Sensory and emotional stimuli and the longer view of cultural adaptation are the reliable guides on our paths. We hope you can join us on the journey.